This is a long-awaited post for me, and probably one of my favorite things to crow about around the dinner table. It was my first extremely successful all-natural beauty product, and remains one of my greatest long-term successes. As a little backstory, I got all whipped up into a frenzy about the crap in all the things that I smear all over my body and hair, and decided, in much the way that I decide lots of things, to go completely all-natural from that exact moment on. This was certainly challenging. The first thing I tried was all-natural shampoo, and I am lucky that that didn’t ruin me for all-natural products for life. My first attempt was terrible. My second attempt was worse. I reached a low point when I found myself trying to pick fenugreek seeds out of my scalp after a disastrous fenugreek deep conditioning attempt. I am working on a really good all-natural shampoo recipe now, but I’m not going to tell you about it until I’m sure it works. Shhhhh. But, thank god, the next thing I tried was this innocent soapmaking recipe I found on the internet. I thought it looked interesting…coconut oil soap! And it seemed doable to create. What emerged from my makeshift soap molds (see below) five hours later was pretty much heavenly. Now, I’m not going to LYE to you (ha!!! ): because it has (naturally occurring) lye in it, it can be a bit drying. I combat this by washing it clean shortly after applying it (in other words, don’t let it sit on your skin forever), and does require some concentration when making it so that you don’t splash skin-melting raw lye all over yourself. But seriously, if you manage to maim or kill yourself making this recipe, I’m afraid I can’t help you. You need some professional help. This might be a TMI moment, but its important to the story arc, so I’m including it. Since the beginning of time (or puberty), I have suffered from folliculitis anywhere a razor touched my skin. I’m talking big, swollen, painful, pus-filled red bumps that got even more infected with exposure to chlorine or salt water or sun. It made swimsuit season a constant ordeal and swim team almost unbearable. Tank tops were frequently banished due to insecurity issues, and shorts became a part of my bathing suit routine. I have tried everything. I have tried single-use disposable razors (no effect). I have tried waxing, laser hair removal, and threading instead of shaving (no effect, and waxing made me break out even worse, which I didn’t know was possible). I have tried “No Bump” and other products promising the removal of said bumps (no effect). Antibiotics had a lackluster effect on them. Soaking my razors in rubbing alcohol didn’t even touch them. Changing shaving creams, using none at all, using oil only, switching body washes, etc. Nada, zip, zilch. I used this soap for the first time, and two days later, every single bump was gone. I’m talking modern medical miracle here, people. Turns out, the only thing I can think of is that I was violently allergic to one of these sneaky things they put in most body washes and shaving creams. And I haven’t had one since. Since its first birth, this soap has taken on some other incarnations as I tweaked and polished the recipe for my needs. I tried adding jojoba oil first, and discovered that it made me break out a little. I switched to avocado oil, and that was okay. I tried sweet almond oil, and that’s my favorite additive so far, making the soap creamier and more moisturizing without compromising the cleansing effects, with the exception of my Flash of Genius Face Bar. I realized that if I added tea tree oil, it would act as an acne-preventing face soap, and that REALLY changed my life. Proactiv is officially out of my life. I free-cycled all of my gluttonous hoarded bottles of Proactiv and never looked back. What follows is the how-to for this soap, as well as some tips and tricks I’ve learned along the way. Very much recommended, and don’t tell me if you don’t like it, because I might have to beat you up. That’s how much I love this soap. Keep it to yourselves unless you love it, in which case, please feel free to shower praise upon me. The original recipe comes from Mommypotamus. She’s pretty awesome, and her blog is super informative. – 4.83 oz. PURE lye (NaOH, or sodium hydroxide, for you chemistry people. This is also an active ingredient in meth production and a potent drain cleaner, so you can find it at your local mom and pop hardware store, but be prepared to be met with some suspicious looks as you walk up to the register with your haul of lye, rubber gloves, and various glassware. *** MAKE SURE its 100% lye. It should say on the bottle something along those lines. Other products have dangerous additives in them that will deeply affect your soap and most likely your skin). – Safety equipment, unless you’re like me and take a shockingly cavalier view on splashing skin-melting lye on yourself. No, just kidding. I wear gloves and safety goggles and try to remember not to do it in bare feet. 1. First, I melt the coconut oil a little bit for ease of scooping. 1 minute zap in the microwave (in a glass jar) makes it so much easier to scoop. 2. Scoop the appropriate amount of coconut oil into a bowl on your scale. Remember to place the bowl on the scale and then tare the scale so that only the coconut oil is measured and not the weight of the bowl. 3. Turn your crockpot on to low. 4. Place the coconut oil in a pot and warm it to 120 degrees. Keep an eye on it because it warms fast! 5. Meanwhile, don your protective equipment and prepare to bravely battle the lye. It’s not that hard, I promise. 6. Into a small bowl, measure your lye crystals and set aside. 7. Into a large bowl, measure your water. 8. Take the lye, the water, and your long-handled spoon outside or to a well-ventilated area (this is important! Lye vapors can cause some respiratory irritation if inhaled in large amounts). 9. 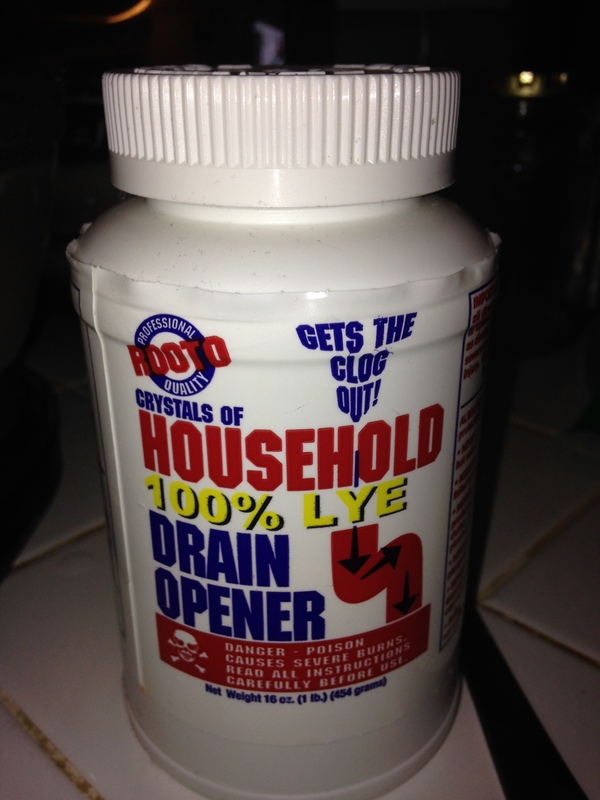 Carefully pour the lye crystals into the large bowl of water while stirring constantly. Position yourself downwind or wear a mask to avoid inhaling the vapors. You will notice a fine steam start to rise from the bowl. The mixture will be cloudy at first, but after some stirring, it will begin to clear. When it is no longer opaque, you can bring it inside carefully. ** NOTE: the bowl will be HOT to the touch because this is an exothermic chemical reaction. Use caution when picking up your bowl. 10. Pour your melted coconut oil into the slow cooker. 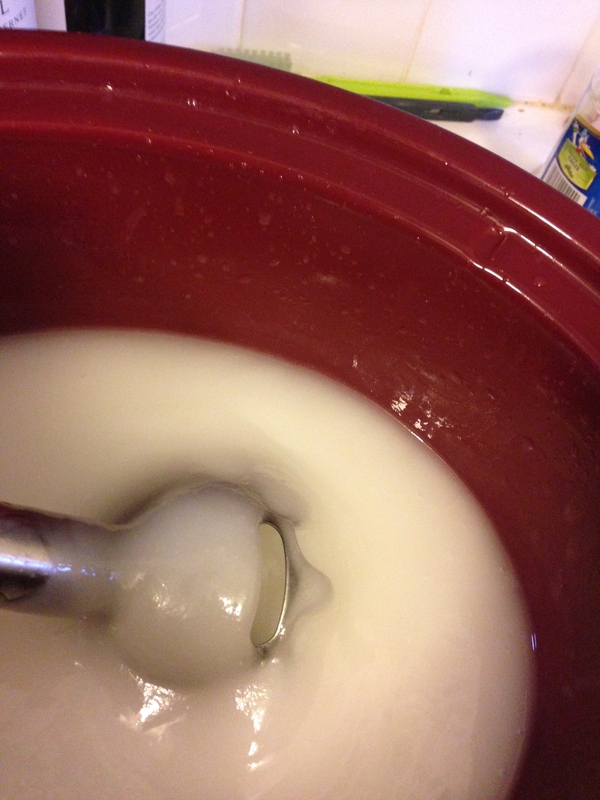 Pouring carefully and avoiding drips, add the lye mixture to the coconut oil and stir gently. 11. Using the stick blender, start blending the mixture until it reaches “trace”. Trace means that the chemical process of neutralizing the lye has begun. Your soap will be opaque and have the texture of a light pudding. I have done my best to illustrate what trace looks like in the photo below, because the first time I made this soap I was like (??? Trace???). See how its kind of goopy and opaque? That’s trace. 12. Pop the lid on your crock pot and let it cook for 45 minutes to an hour. Keep an eagle eye on it, because my soap likes to do the Amazing Blob routine where it cooks innocently until I decide it’ll probably be okay and walk away, only to have it fluff up enormously, ooze out the top of the crockpot and make a triumphant dash for freedom down the counter. It’s a mess. 13. At the end of your cooking process, the soap should have fluffed up and then folded back down on itself and look like…well, soap. Crumbly and not shiny, with no pits of oil. 14. Now comes the best part. Scoop a little on your finger or a spoon (careful, its going to be hot and I don’t want any of you suing me for not realizing that the stuff in the hot crock pot was also hot, although I like to think my readers are far smarter than that). Touch it to your tongue. It it “zaps” you, like licking a battery, your lye is not fully converted. You can also use pH paper, and if the reading is higher than 10, its not done. Unconverted lye in the soap can burn your skin, so this step is important. 15. This is where you add any oils you like, such as sweet almond oil, tea tree oil, or essential oils for scent. Add them, stir it up, and then pour into your soap molds. I use bread pans lined with parchment paper. 16. Pop it in the fridge if you simply cannot wait to use it, or wait patiently for it to harden at room temperature. It’s actually much easier to cut the soap at room temperature, and even while its still a little soft, because when it hardens up, it’s actually quite difficult to cut. 17. Go take a shower and report back! ← Titanium dioxide and YOU!